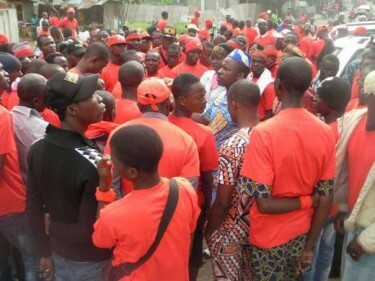 Since July 17, 2013, every Wednesday many Beninese dress in red and gather together to say no to the revision of the constitution by the President of the Republic Boni Yayi. This revision would permit Boni Yayi to stand in the next presidential elections. This color evokes courage. This constitutional revisions by President Boni Yayi is opportunistic and doesn't include under any circumstance the interests of the people. By mobilizing, we staunchly refuse this revision. The people are hungry and are tired of an incapable government. Red Wednesday, all red. Don't touch my constitution! The Red Wednesday [fr] movement, launched by the organization [fr] “Alternative citizen” in effect seeks to assemble all Beninese disappointed with the current government since it's inception in 2006. But also, and above all, it seeks to end the project of revising the Beninese constitution, which according to the members of the movement, would permit the president to stand in the 2016 elections and to create a new republic. The revision of the Beninese constitution submitted in April 2013 calls for, among other things, the creation of a Court of Accounts, the initiation of laws by the people, the institutionalization of the National Autonomous Electoral Commission (CENA) or still the limitations of economic crimes. The revised constitution would also allow the president to run one more time for president. Born on Facebook [fr], the movement has begun to amplify on the streets of the country. T-shirt, pants, scarf, red caps, all the means are good to sustain the movement. 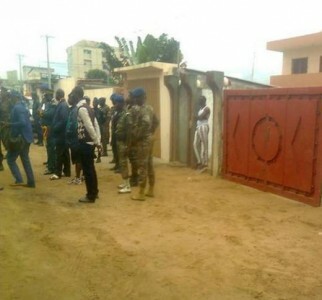 According to the previous Communication Minister Gaston Zossou [fr], this movement is not liked by the Boni Yayi administration as Zossou says on his Facebook account that his home was encircled by police officers on August 1, 2013, the country's independence day, to keep him from going to join the Red Wednesday protesters. Soldiers near the home of Gaston Zossou. Photo: Red Wednesday Facebook page with their permission. However, this movement is far from creating unanimity. On one side, some question the good faith of the principle actors of the movement, such as Joseph Djogbenou, suspected of manipulating the cause with the support of businessman Patrice Talon, who is the the attorney in the case of the attempted poisoning of the head of state [fr]. Seeking publicity, Gaston Zossou, where the Beninese still recall in good faith his disastrous management of the GSM sectors and of the TITAN dossier when he was Communication Minister, is active on social networks notably Facebook where he leads an intellectual opposition based on his nostalgia for affairs of State. The police are right to keep a close watch on this to avoid that this kind of character doesn't lead the youth into a scandalous adventure. Revelations that certainly have already incited defections, such as that of Andoche Amégnissè, a great activist known on social media for his engagement among the Red Wednesday activists. Secondly, the supporters of President Boni Yayi have imitated the movement and initiated the “White Friday” movement [fr]. The Minister of the Interior Benoît Dégla has declared [fr] that the “causes that defend the initiators of the Red Wednesday are not founded” and has qualified the movement as poison. The movement that leads the revolt is manipulated.